September is National Childhood Cancer and Sickle Cell Awareness Month. 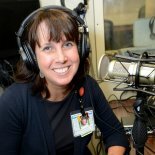 Dr. Kim Whelan talks about the Alabama Center for Childhood Cancer and Blood Disorders, and its impact on patient care in the state of Alabama and across the country. Together, the University of Alabama at Birmingham (UAB) and Children's of Alabama are one of only 19 sites nationwide to participate in the Children's Oncology Group phase one and two consortium which allows our families to have access to the newest drugs and promising clinical trials without having to travel out of state. Each year, more than 1,500 children come to our center for care, and more than 300 dedicated pediatric healthcare professionals provide exceptional patient care, education and research. We are committed to finding a cure for all children – down the street and around the world.